The Amur area is located in the southeast of the Russian Federation. It borders in the south and southwest upon China, in the north - upon Republic of Sakha, in the northeast and east - upon Khabarovsky Krai, in the southeast - upon the Jewish AO. In the northern part of the area there is Stanovoy mountain ridge (height up to 2312 m), to the south - chain of mountain ridges Yankan, Tukuringra, Soktakhan, Dazhgdy; Zeisko-Bureinskaya and Amursko-Zeiskaya plains occupy about 2/5 of the territory. The main rivers are: Amur, Zeya, Bureya. The lays in moderate thermal zone. The climate is continental with monsoonal features. It is windless almost all the year. The average annual speed of wind is not more than 3,6 m/s. The average temperature of January in the south is 27,6?C below zero, and in the north is 32,8?C below zero. Temperature goes down on 0,76? degrees for each of 100 km of distance. The average temperature in July changes from 20,7?C above zero up to 17,6?C above zero. Amount of precipitations is about 850 mm per year. Soils are brownish forest. In the territory the coniferous and mixed forests of manchurian type prevail. In mountains there are bushes of cedar elfin woods and mountain tundra. Unique nature sanctuaries, originality of flora and fauna, frontier position of the area create necessary prerequisities for the scale development of the international tourism in the region with attraction of foreign investments. Priamurye was discovered by the group of Russian explorers led by Vasily Danilovich Poyarkov in the first half of XVII century (1643-1644). In 1649, Erofey Pavlovich Khabarov explored Priamurye and he founded Albasin, which was the main city of Russian possessions in Priamurye. 1854 was start of the so-called "muraviev alloys" - cossacks resettlement from Transbaikalia in lower reaches of Amur, and Priamurye finally became a part of Russia. Under the Decree of the Emperor of December 20 (8), 1858 the Amurskaya Oblast was established. Priamurye economic development began. The main population of the Amurskaya Oblast newly arrived, there was some waves of immigrants. In the beginning were moved the Transbaikalian cossacks who formed the Amur Cossack army and established chain of villages and farms in the valley of the rivers Amur and Zeya. The second big group of the population before the revolution was formed by peasants from the central areas of Russia which resettlement began in 1859. In April, 1920, to avoid war with Japan, the "buffer" democratic state named Far East Republic, with the centre in Chita was formed from the Amurskaya, Transbaikalian, Kamchatskaya, Sakhalinskaya, Primorskaya Oblasts and existed for two years. In November, 1922 Far East Republic joined RSFSR and in November 8, the same year the Amurskaya Oblast was renamed to the Amurskaya Gubernia and existed till 1926. October 20, 1932 is the date of entering of the area into the Russian Federation structure. During administrative transformations of 1920-1930's the area was the part of the Far East Republic. 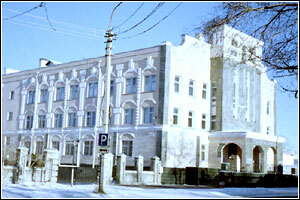 Since October 1938, the area was the part of Khabarovsky Krai. In August 1948, the Amurskaya Oblast was detached from its structure into independent oblast. The territory of the area is 363.7 thousand square km (2.13% of the Russian Federation). 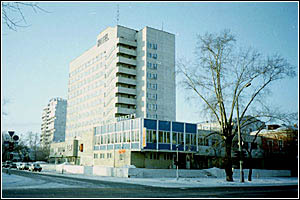 City of Blagoveshensk is the administrative centre of the region. 1858 is the year of the oblast formation. The population is 216.7 thousand people (1994). Distance from Moscow to Blagoveshensk is 7985 km. 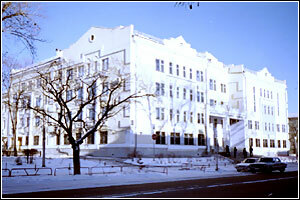 Blagoveshensk has two districts: Leninsky and Pogranichny. Albasin Ostrog was the largest fortified settlement of Russian pioneers on the Amur river in the second half of XVII century. Founded in 1665, Albasin quickly turned into the economic, administrative and cultural center of the Russian settlers on the Amur river. In 1670, 1685 and 1686-1687 Albasin Ostrog was besieged three times with the armies of Manchurian China. After the signing of the Nerchinsk Treaty in1689, having destroyed the fortifications, defenders of the fortress abandoned it (the Amurskaya Oblast, Skovorodinsky district, Ablasino village). The ancient settlement "Shapka Mountain" was founded and occupied by Mohe and Chzhurchzhen tribes at the end of the first millenium. It was a part of defensive installations of Tszin' Empire on the Amur river. Fortifications - ditches, walls - are still intact. They were discovered by E.V.Gonsovich in 1913. It was explored by E.I.Derevyanko in 1979. (Mikhailovsky district, 4-5 km to the west from Poyarkovo village). The lower and upper paleolith sites at Kumary village (300-12 thousand years) are the most ancient monuments of archeology of the Far East. They were discovered by A.P.Okladnikov in 1953. (Shimanovsky district, on the site of former Kumary village). The dinosaurs cemetery is the unique nature sanctuary located in the southeast suburb of Blagoveshensk, on the first mounting base of the Amur. The area of the monument - 10000 sq. m., capacity of bones layers - up to two meters. From remains taken from the right coast of the Amur in 1911, the skeleton of dinosaur for the All-Union geological institute museum in Saint-Petersburg was mounted.